Masahiro Sakurai has revealed yet another platform specific stage for Super Smash Bros. This time around the goods come for the Nintendo 3DS variant of the game. Sakurai took to his Miiverse page and showed off the image you see at the head of this post. He declared its source as Paper Mario, and series fans will recognize the locale as a spot in Sticker Star, the recent 3DS entry. Pic of the day. 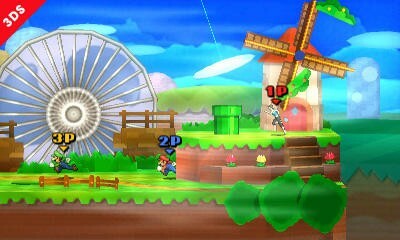 For the first time ever in the Super Smash Bros. series, here’s a Paper Mario stage! It’s made of paper, so strong winds will blow it away. The strong winds? My money’s on the fan. Sakurai took to the comment section of that post in order to toss another screenshot and a bit of information into the fray. Here’s that quick run. Since the stage is paper, it transforms when it folds over and opens up again. 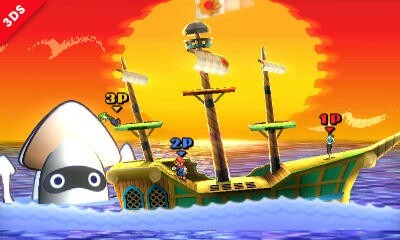 This ship is the S.S. Flavion from Paper Mario: The Thousand-Year Door. So, we have a stage that will dynamically change over the battle into different locales within one franchise. I love that stuff. The Nintendo 3DS version of Super Smash Bros. is set to drop on Oct. 3 of this year. The Wii U version of the game, while still rolling without an exact release date, will hit this holiday.